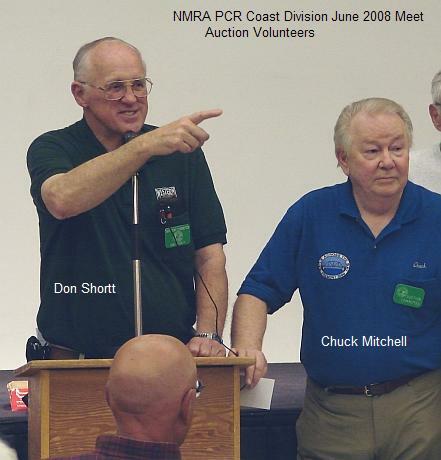 At every quarterly NMRA Coast Division Meet, we have an Auction that is rich with a wonderful array of model railroading treasures being sold by our members. Brass locomotives, locomotives, rolling stock, structures, kits, parts, books, videos, magazines, and more are to be found - this is a rich resource for hard-to-find items long gone from the hobby shop shelves, and at very good prices. Come out, browse, shop, and enjoy the fun! You never know what you will find! Coast Division Auction Rules (effective as of January 1, 2018). These Auction documents require Acrobat Reader to view. You may click here to download the free Acrobat Reader viewer. How does the Auction benefit the Coast Division? The Coast Division quarterly Auction directly benefits all of us, in that the seller automatically donates a small 10% of the auction selling price. 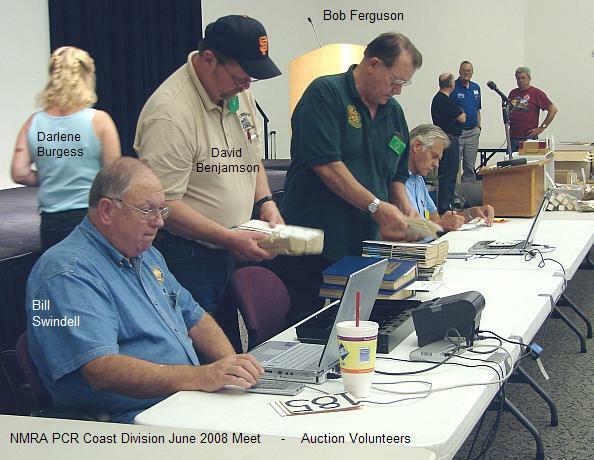 This small amount of money adds up over the course of all the items auctioned off, and is a significant source of income for Coast Division to pay for things like the Coast Dispatcher printing and mailing, expenses to cover costs of holding the meets and events, and other expenses to support our services to our membership. Most of all, of course, the items in the Auction benefit all of us as true bargain-hunters and treasure-hunters! Come on out and see what is there! Note: You can meet the criteria for being a NMRA member in good standing, by purchasing a NMRA Railpass $9.95 trial six month membership, right at the Coast Division Meet from our Registrar. That's a great deal! Note that the Railpass offer is good in the U.S. only, and is for new members and those who have not been NMRA members for two years or more. Our auction is chairperson is John Ameling; you can contact him by clicking here. Bill Swindell, Bob Ferguson, Darlene Burgess, David Benjamson, John McCool (not pictured), and many more on the Auction Accounting crew!